VICTORVILLE • After six years of debate and delays, a split City Council gave the green light Tuesday to a controversial Walmart Supercenter planned near the entrance to Spring Valley Lake. The project passed on a 3-1 vote, with Councilwoman Angela Valles opposed and Mayor Ryan McEachron abstaining because his insurance agency does business with the Spring Valley Lake Association. One angry resident was removed from City Hall during the four-hour discussion, as both sides passionately argued their views on the project. Walmart spent the last eight months changing its design and remediation plans to respond to residents’ concerns over how the new store along Bear Valley Road near Tamarisk Road will impact flooding in the area, developer Stan Rothbart said. “We have chosen to retain 100 percent of all runoff on site,” Rothbart announced. 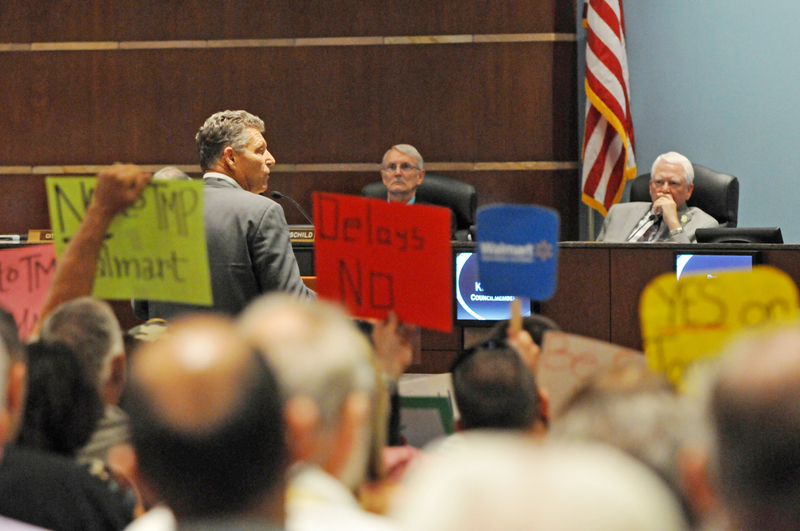 Protesters who packed City Hall holding signs and objecting to the site didn’t buy it, drawing a scolding from Mayor Pro Tem Rudy Cabriales when they booed Rothbart. Councilwoman Angela Valles expressed concerns over traffic congestion, truck volume, pedestrian safety and the cost of ongoing road maintenance near the site. “If you couldn’t keep Victorville’s store safe and clean, what makes you think you can do that for the Spring Valley Lake store?” Valles asked, referencing the chain’s shuttered Bear Valley Road store. Walmart representatives defended their environmental review, safety record and mitigations, arguing the project will keep customers from driving further down congested Bear Valley Road to get to stores on the west end of the city. “Let the business do its business,” one speaker told the council, supporting Walmart’s right to open where it pleases. The discussion got heated when Upland-based attorney Corey Briggs recommended the city recirculate the project’s environmental review with the new flood plan included, so residents can review and respond to it. Briggs also threatened to file a civil lawsuit against Cabriales for participating in the discussion. Briggs cited a potential conflict of interest because Cabriales’ wife, Vickie, in her former role as director of the High Desert Hispanic Chamber of Commerce, once received commission from donors such as Walmart. “If you want to sue, get in line,” Cabriales responded, denying any conflict — a position supported by the city attorney. Largely citing vague or obscure environmental concerns, Briggs has sued Walmart more than a dozen times on behalf of citizen groups, including stores in Victorville, Hesperia and Barstow. Each time, Briggs’ protests have slowed progress on the large projects, delaying them by as much as three years. No details were available at press time as to when construction will start on the new Walmart Supercenter.